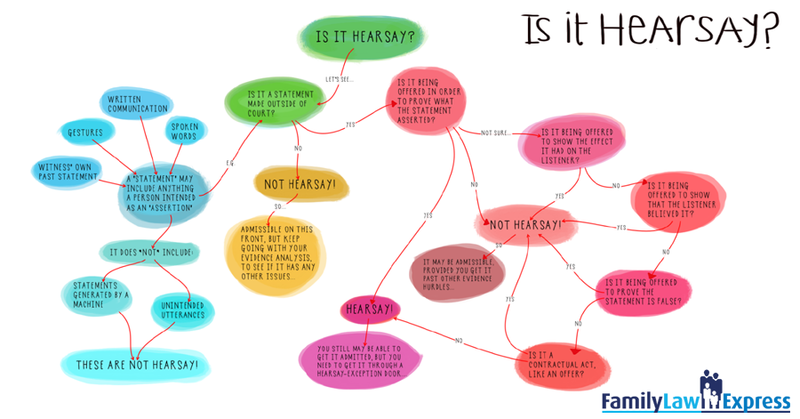 Hearsay is often colloquially referred to as ‘he said, she said’. It is a statement being used to prove the truthfulness of something based on the fact that somebody else said it was true. If you were in the Family Court for instance, and you said “I saw John read his daughter a bedtime story”, this would not be hearsay because you are talking about something you personally witnessed. However, if you said “Jenny said that John read his daughter a bedtime story”, it would be hearsay because you are trying to prove that John read his daughter a bedtime story based on the fact that Jenny told you it happened. 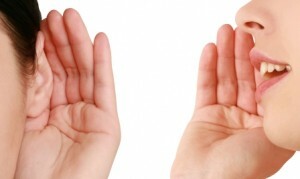 There are two types of hearsay; first-hand hearsay which is inadmissible unless it falls under an exception and second-hand hearsay which is always inadmissible. In other words, first hand hearsay is when you’re talking about a statement, note or other communication where the person who communicated the information actually saw, heard or experienced what happened. In our example scenario, the “asserted fact” is that John read a bedtime story to his daughter and the statement was made by Jenny who had “personal knowledge” since she was the one who saw John read the story. This is first-hand hearsay. Second-hand hearsay is more remote than this. If you say to a family report writer “Jenny said that John read the bedtime story”, and the family report writer then gave evidence in court by saying “Someone told me that Jenny said that John read to his daughter”, this would be second-hand hearsay. This is because the “representation” is not what Jenny said to you, but what you said to the family report writer. Since you didn’t have “personal knowledge” of whether or not John read to his daughter, it is second-hand hearsay. Why is it generally inadmissible? The courts favour ‘original evidence’, which means hearing what happened from people who actually experienced the event in question. The idea behind this is that it is the closest the judge can get to actually experiencing what happened and the other side has the opportunity to cross-examine the witness and the evidence they are presenting. For example, if you were a witness in the Federal Circuit Court and you said “I saw him read to his daughter”, that would be original evidence because it is what you saw and you are able to be cross-examined. Your statement can be used as evidence that the father did indeed read a bedtime story to his child. If you were in court and said “My friend Jenny said that she saw him read to his daughter”, this would be hearsay evidence because you didn’t personally witness the father reading to his child. Your statement in this case cannot be used to prove that the father read a story to his child. In a situation where this is the case, it would likely be Jenny that is asked to be a witness in court since she is the one who claims to have actually witnessed the father reading to his child. What are the exceptions to admissibility? When it is being used for another purpose. 2 Hearsay is generally inadmissible to prove that the asserted fact was true. So we can’t use what Jenny said to you to prove that John read to his daughter. However, your statement might be admissible for another purpose (e.g. a defamation claim) not to prove that John read to his daughter, but to prove that Jenny said that John read to his daughter. If the person who made the claim is unavailable. This applies to both civil proceedings 3 and criminal proceedings. 4 Unavailable to give evidence is defined to include that all reasonable steps have been taken to attempt to find the person and secure their attendance without success. Susan Jayne is currently in her fourth year of attaining degrees in both Law and Psychology. While volunteering at a Psychology Clinic throughout her university studies, she’s aspiring to find a career which utilises her new found knowledge in both of her chosen fields.